Welcome to our Endowment Page! We would like to say thank you for the support that you have shown the Junior League of Lancaster and its endowment in the past for our future. A healthy endowment will ensure the League’s time and resources remain vested in the Lancaster County community. The enriched endowment will provide us with yearly income through earnings on investments to further our community involvement. We are happy to report that the league continues to towards our goal of increasing the Junior League of Lancaster’s endowment. The Finance Committee will continue to educate membership about our endowment, plan events and communicating through various sources. The support we have received from Emeritus, Sustainer, and Active members, as well as the Lancaster Community, has been astounding. Gifts to the endowment can be made by cash, check, or credit card anytime throughout the year. A planned gift, through your estate, is a powerful way to preserve the Junior League of Lancaster’s future. 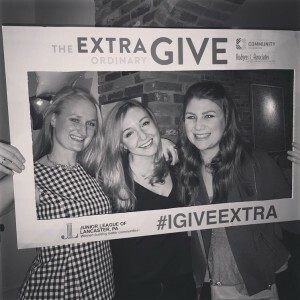 If you have not had a chance to give or would like to make your gift count, once again, please consider giving on ExtraOrdinary Give Day in Lancaster. The gifts the League receives on that day will have the extraordinary ability to be increased by a stretch pool from the Lancaster County Community Foundation or to win a bonus for the endowment! On behalf of President, President Elect and the League as a whole, we would like to thank you for your gifts to the Junior League of Lancaster. Your investment will enable the League to continue educating and empowering women to address critical needs and make a lasting difference in our community. Thank you all for the love and support you have shown the endowment. Click here to give today! Membership in Junior League is open to all women who are 21 years of age who demonstrate an interest in and commitment to voluntarism. Junior League of Lancaster reaches out to women of all races, religions and national origins.